The entire web world is built with a few programming languages which slightly vary in their taste and features. The silent war between languages is strengthening with the introduction of new ones into the scenario and this also provides the programmer, a variety of choices. 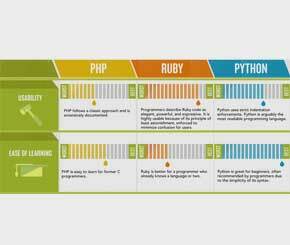 An infographic study by Udemy compared 3 modern day programming languages: PHP, Ruby and Python, based on various criteria to find their priorities in the web world. PHP was created by Rasmus Lerdorf in 1995. It is primarily designed for web development to produce dynamic web pages. The design is influenced by languages like C, Java, Perl and C++. Sites like Facebook and Wikipedia is built with PHP. Ruby was created by Yukihiro Matz Matsumoto in 1995. It was designed to make the programming simple and flexible for the programmer. Languages like Lisp, Perl, ADA, Dylan and C++ influenced its design. Sites like Twitter and Groupon is built with Ruby. Python was created by Guido Van Rossum in 1991. It was designed to emphasize productivity and code readability. The design is influenced by languages like ABC, Lisp, Perl Java, C++. Sites like Youtube and Google is built with Python. Ruby tops the usability section by its principle of least astonishment, enforced to minimize confusion for users. The most readable language, Python comes second followed by the extensively documented PHP. In ease of learning, python leads section with PHP on the second followed by Ruby. 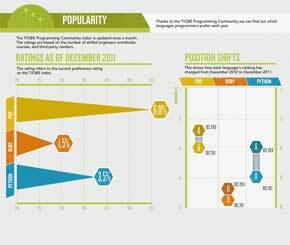 Popularity is based upon the languages preferred by programmers each year. According to the TIOBE programming community index, PHP is the most popular language with 6 percent of programming, followed by Python with 3.5 and Ruby with 1.5 percent. The ranking of PHP had come down from 4th in Dec 2010 to 6th in Dec 2011. Python also lost 2 positions making it on 8th while Ruby continues to be in the 11th position for the two consecutive years. 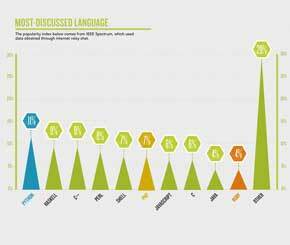 The IEEE spectrum used the data obtained from the internet relay chat to find the most discussed language. According to the data, Python is most popular with 11 percent followed by PHP at 7 and Ruby with 4 percent. The “other” languages contribute to a 29 percent. The marketability of a language is measured by considering the availability of jobs and the number of developers working on a specific platform. In both the cases, PHP leads the list. 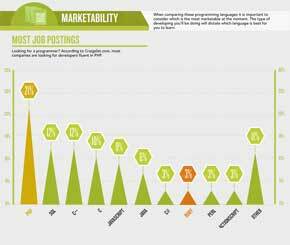 According to Craiglist.com, most companies are looking for PHP developers. Monster.com also has the most openings for PHP developers, followed by Ruby and then Python. The number of PHP developers in Linkedin reach to 19,000 followed by Python at 1316 and Ruby at 720 as of Dec 2011. 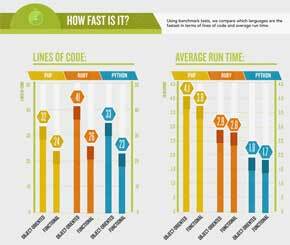 Based on the benchmark tests, the languages are compared for speed in terms of lines of code and average run time. In lines of code, Ruby leads the list followed by Python and then PHP. In the average run time, PHP comes in a range of 3.8 to 4.1 seconds, Ruby with 2.8 to 2.9 seconds and Python with a range of 1.7 to 1.8 seconds. Phone with 15 years of battery life!